Mining makes up a major part of the Russian economy, and indeed it is easy to see why. Russia is home to a variety of precious gems that are prized throughout the world for their quality and size. Russia produces about 25% of the world’s diamonds and a large portion of other precious gems, such as emeralds, garnets, and alexandrite, as well as lesser gemstones such as agate, charoite, malachite, and amber. In 1830, a peasant walking the banks of the Takovaya River in the Ural Mountains discovered a fallen tree with green stones in its exposed roots. These were confirmed to be emeralds, and the area was immediately developed as a mine to supply Russian nobles with high quality stones. The mine yielded not just emeralds, but other gemstones such as aquamarine and alexandrite. 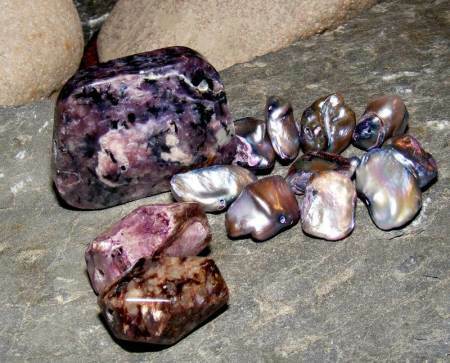 Since then, mining for gemstones has been a major industry in the Urals and throughout Siberia. 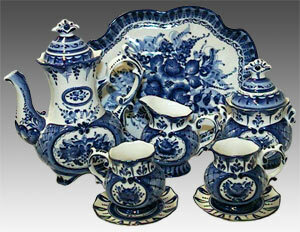 Russian art is popular throughout the world and known for its superior style and craftsmanship. 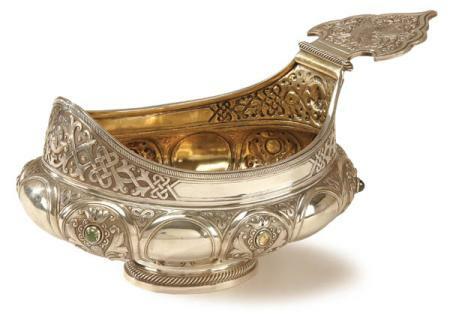 However, few products are as loved by collectors as Russian silver and silverware. 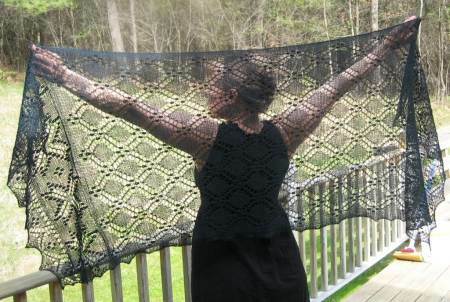 The Orenburg shawl is one of the icons of Russia, a truly Russian item that can only be made properly by trained Russian artisans according to age-old secrets. Finely knit from the fur of an indigenous goat that is similar to cashmere or angora, the Orenburg shawl offers unbelievable warmth for icy Russian winters but is thin and durable enough to be pulled through a wedding ring. For this reason, they are often known as wedding ring shawls. Sharing tea with family and guests is a huge part of Russian culture, making samovars an irreplaceable part of the Russian home. They may come in a variety of shapes and are usually made to be decorative as well, with painting, gilding, and Russian folk designs. 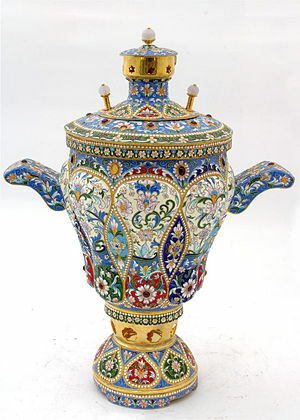 The samovar is usually kept in the common area of the home for easy access and their high decorative value. The traditional samovar is a metal container heated by coal, charcoal or other fuels such as dried pinecones. However, many modern samovars are electric and work similar to a commercial water heater. Because they are usually used for tea, many models include an attachment that can hold a teapot with tea concentrate. What is Gzhel? This type of ceramics has become popular with collectors throughout the world, especially with those who favor Russian crafts. Named after the Russian village in which the pottery originated and is still made to this day, Gzhel is a type of ceramic that is a creamy, translucent white color with hand painted blue designs arising from folk traditions. Gzhel is different from other types of indigenous Russian pottery in several ways. First, Russian handicrafts tend to favor red and gold colors, while Gzhel pottery has a much cooler color palette. Second, most Russian pottery is earthenware, which is much thicker and rougher than the fine, creamy white Gzhel porcelain.